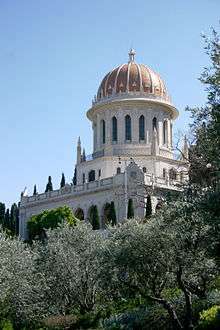 Tomb where the remains of the Báb are enshrined. On the morning of July 9, 1850 in Tabriz, a young Persian merchant known as the Báb was charged with apostasy and shot by order of the Prime Minister of the Persian Empire. The events surrounding his execution have been the subject of controversy among researchers, and are regarded as miraculous by Bahá'ís, who consider him to be a Manifestation of God. The Báb and one of his companions were suspended on a wall and a large firing squad prepared to shoot. When the smoke cleared after the first firing of bullets, the Báb was missing. Reports continue by stating that the Báb was found back in his prison room finishing dictation to his secretary. Other sources, which include Persian and European reports, give a variety of accounts, some in agreement with the miracle-like Bahá'í story, and some indicating a less miraculous event. All agree that he survived the first firing squad, and was killed by the second. For many years after his death, the remains of the Báb were secretly transferred from place to place until they were brought to their final resting place at the Shrine of the Báb in Haifa on the middle terrace of the Bahá'í Gardens. The anniversary of this event is commemorated by members of the Baha'i Faith at noon on Rahmat 16 (Sharaf) (of the Baha'i Calendar - i.e., July 9 or July 10). It is one of nine Holy Days when work is suspended. In 1850 a new prime-minister, Amir Kabir, ordered the execution of the Báb; he was brought to Tabriz, where he would be killed by a firing squad. The night before his execution, as he was being conducted to his cell, a young man, Anís (sometimes called Mulla Muhammad Ali), threw himself at the feet of the Báb, wanting to be killed with the Báb. He was immediately arrested and placed in the same cell as the Báb. On the morning of July 9, 1850, the Báb was taken to a courtyard filled with nearly ten thousand people wishing to watch his execution. The Báb and Anís were suspended on a wall and the firing squad of 750 rifles prepared to shoot. The Báb and His disciple were suspended by ropes from a nail in the wall, the head of Mirza Muhammad-'Ali resting on the breast of the Báb. Seven hundred and fifty soldiers were positioned in three files. Roofs of the buildings around teemed with spectators. A frantic search followed. The Báb was found, sitting in the same room where He had been lodged the night before, in conversation with His amanuensis. That conversation had been interrupted earlier in the day. Now it was finished and He told the farrash-bashi to carry out his duty. But the farrash-bashi was terror-stricken and ran away, nor did he ever return to his post. Sam Khan, for his part, told his superiors that he had carried out the task given to him; he would not attempt it a second time. So Aqa Jan Khan-i-Khamsih and his Nasiri regiment replaced the Armenians, and the Báb and His disciple were suspended once again at the same spot. The Nasiri regiment fired. The bodies of the Báb and His disciple were shattered, and their flesh was united. These events were witnessed by western journalists. Provided below is one source that is attributed to Sir Justin Shiel, Queen Victoria's Envoy Extraordinary and Minister Plenipotentiary in Tehran and written to Lord Palmerston, the British Secretary of State for Foreign Affairs July 22, 1850. The founder of the sect has been executed at Tabreez. He was killed by a volley of musketry, and his death was on the point of giving his religion a lustre which would have largely increased his proselytes. When the smoke and dust cleared away after the volley, Báb was not to be seen, and the populace proclaimed that he had ascended to the skies. The balls had broken the ropes by which he was bound, but he was dragged from the recess where after some search he was discovered and shot. His death, according to the belief of his disciples, will make no difference as Báb must always exist. Shoghi Effendi also prints a large selection of western quotes in his book God Passes By (p55), however most are unsourced. 1. The Báb and Anís were suspended about three meters above the ground on a rope and fired on by a Christian regiment. 2. The bullets cut the rope and one bullet wounded Anís. 3. The Báb ran into one of the rooms in the barracks. 4. The Báb was brought back out and he and Anís were shot again, this time fatally. 1 2 MacEoin, Dennis (1989). "Bāb, Sayyed `Ali Mohammad Sirazi". Encyclopædia Iranica. ↑ Winters, Jonah (1997-09-19). "Background to Babism: A brief epitome of Babi history". Dying for God: Martyrdom in the Shii and Babi Religions. M.A. Thesis: University of Toronto. Retrieved 2007-01-23. 1 2 3 Balyuzi, H.M. (1973). The Báb: The Herald of the Day of Days. Oxford, UK: George Ronald. pp. 154–161. ISBN 0-85398-048-9. ↑ Effendi, Shoghi (1944). God Passes By. Wilmette, Illinois, USA: Bahá'í Publishing Trust. p. 52. ISBN 0-87743-020-9. ↑ Sears, W. (1995). Release the Sun. USA: Bahá'í Publishing Trust. p. 175. ISBN 0-87743-003-9. 1 2 Sir Justin Shiel, Queen Victoria's Envoy Extraordinary and Minister Plenipotentiary in Tehran, wrote to Lord Palmerston, the British Secretary of State for Foreign Affairs, on July 22, 1850 regarding the execution. The letter, can be found in its original form as document F.O. 60/152/88 in the archives of the Foreign Office at the Public Records Office in London. ↑ Ferraby, John (1975). All Things Made New: A Comprehensive Outline of the Bahá'í Faith. Bahá'í Distribution Service. ISBN 81-86953-01-9. ↑ Effendi, Shoghi (1944). God Passes By. Wilmette, Illinois, USA: Bahá'í Publishing Trust. p. 55. ISBN 0-87743-020-9. ↑ Mírzá Mihdí Khán Zaímu'd-Dawlih, extract from Miftah-i-Babu'l-Abvab ya Tarikh-i-Bab va Baha, quoted in Firuz and Kazem Kazemzadeh, "The Báb: Accounts of His Martyrdom," World Order, vol. 8, no. 1 (Fall, 1973), 23-26. Nabíl-i-Zarandí (1932). Shoghi Effendi (Translator), ed. The Dawn-Breakers: Nabíl’s Narrative (Hardcover ed.). Wilmette, Illinois, USA: Bahá'í Publishing Trust. ISBN 0-900125-22-5. Amanat, Abbas (1989). Resurrection and Renewal. Cornell University Press, 124 Roberts Place, Ithica, New York 14850. ISBN 0-8014-2098-9. Gobineau, Comte (1864). Les Religions et les Philosophies dans l’Asie Centrale. Browne, E.G. (1893). The New History of the Báb. Cambridge. Includes a lengthy introduction, the translation and then appendices.